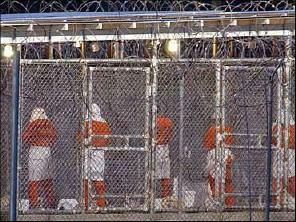 Guantanamo Bay, Cuba - In a medium-security section of the Guantanamo Bay detainment camp, a prisoner uprising was sparked Thursday night when guards tried to stop the fourth attempted suicide of the day. Ten inmates, using fans, light fixtures, pieces of metal, and other improvised weapons, briefly fought ten guards before their revolt was suppressed using "non-lethal force," including pepper spray and rubber bullets. Six of the inmates were treated for minor injuries, and some of the guards suffered bruises.